Taiso Yoshitoshi (1839 - 1892) Famous Fights Between Brave Men: Tomoe Gozen (Eimei kumiuchi zoroi), 1865. 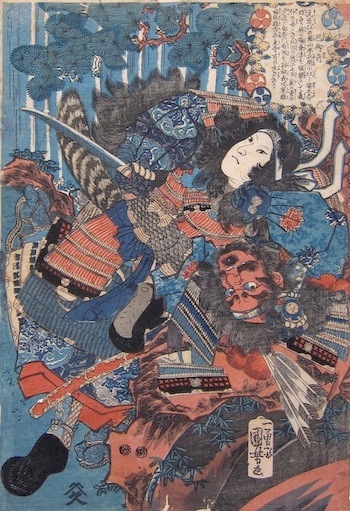 This musha-e, (an historical subject which contains warriors fighting) is a rare print indeed. It is from fairly early in Yoshitoshi’s career… he had been apprenticed to the studio of the great Utagawa School artist Kuniyoshi from the age of 13, Kuniyoshi had given him his name - the ‘Yoshi’ part was an act of homage but to our eyes surely also a symbol of vassalage? As in western artist’s studios the obligation of the student was to ensure the style and the legacy of the teacher. This is self evident in this warrior print. At the top of the page here is the Yoshitoshi and at the bottom of the page is the Kuniyoshi print from 1840, fifteen years earlier. The heritage of the musha-e begins in the early nineteenth century with artists such as Shuntei and Hokusai, and their depictions of Chinese heroes from the novels of the Water-margin, (later successfully translated into Japanese). 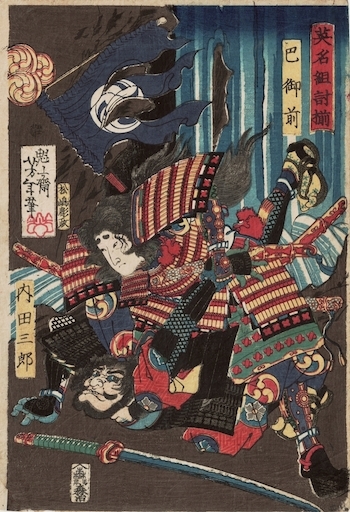 Kuniyoshi responded to his rival, Kunisada, and became wildly popular as the maker of the musha-e genre in lavish heroic triptychs and multicoloured single sheet series. It is this tradition that Yoshitoshi is mimicking here in his homage to Kuniyoshi, four years after Kuniyoshi’s death in 1861. The series title, like the concept, Famous Fights Between Brave Men, is pure Kuniyoshi. What will strike the observant reader is that the first print in the series is not of a 'Brave Man'… but of Tomoe Gozen - an extremely brave woman! Tomoe was especially beautiful, with white skin, long hair, and charming features. She was also a remarkably strong archer, and as a swords-woman she was a warrior worth a thousand, ready to confront a demon or a god, mounted or on foot. She handled unbroken horses with superb skill; she rode unscathed down perilous descents. Whenever a battle was imminent, Yoshinaka sent her out as his first captain, equipped with strong armour, an oversized sword, and a mighty bow; and she performed more deeds of valour than any of his other warriors. In the history of the clans, Tomoe was the mistress of Minamoto no Yoshinaka, an ambitious samurai who desired to be leader of the whole Minamoto Clan. His cousin Yoritomo resented his grab for power and despatched his brothers to kill him. Yoshinaka was eventually defeated at the battle of Awazu in 1184 where Tomoe Gozen took at least one enemy head. Yoshinaka ordered her to flee and the chronicles report that she became a nun in Echizen. Tomoyoe lived on in the chronicles of the Heike and was especially popular during the late Edo in Japanese prints and stage dramas. Perhaps in some part, this was a subtle criticism of the feudal system that ruled Japan from the time of Yoritomo until 1868 – she fought on the side of the defeated Emperor after all. More recently, she is the lead character in a popular trilogy of novels by Jessica Amanda Salmonson published in 1981 set in an alternate universe similar to feudal Japan. Yoshitoshi takes several aspects of Kuniyoshi’s design, not least the portrait of Tomoe herself, although he adds a different eyebrow style for some reason. He borrows the backdrop of the waterfall, and the face of Uchida Saburo is the same as the face that Kuniyoshi has used to depict the Taira warrior Musashi Saburoemon Arikuni. The question here is that since neither (obviously) is a lifelike portrait, why did Yoshitoshi choose to depict Tomoe killing a member of the Minamoto clan and not the traditional depiction of the enemy, Taira clan? Uchida Ieyoshi ( died 1184) was a samurai warrior of the Kiso Minamoto, most famous for dying at the hands of Tomoe Gozen. In 1184, Minamoto no Yoshinaka, head of the Kiso Minamoto clan, betrayed his cousin Minamoto no Yoritomo. Ieyoshi confronted Tomoe, hoping to capture her, Tomoe swung her katana and slew him. This is what Yoshitoshi illustrates here. Yoshitoshi was a difficult, angry and sometimes violent man. I’m guessing that the change of subject here is a political gesture at a time when Japan was going through a revolution that would depose the Tokugawa clan and restore the Empire. Yoshitoshi quotes his late teacher so fully that this whole series can only really be read as an homage. Nevertheless in this superb print, Yoshitoshi makes clear that he is the rightful heir to the great genius of Kuniyoshi and his early promise was recognised fully by the end of the decade.